Porter, an All-American, is the first player from a Washington high school to win the award. Roy has the Raiders in line for a national championship next month. The awards keep pouring in for Nathan Hale’s boys basketball team. 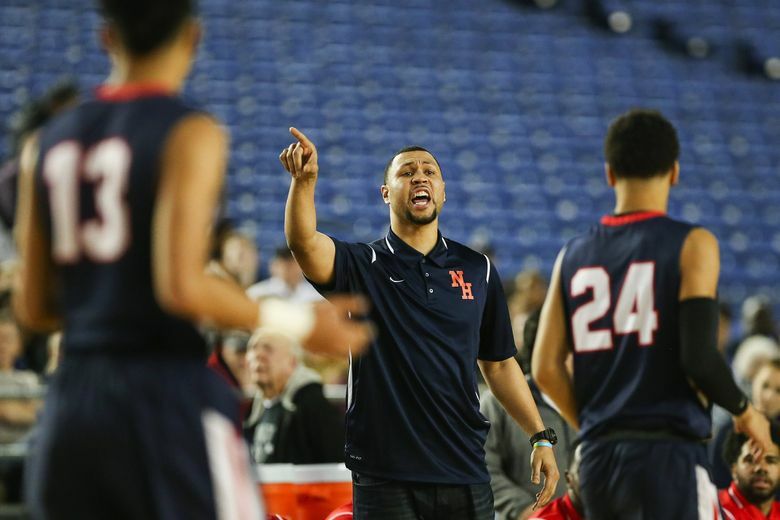 Two weeks after winning its first Class 3A state boys title, All-American Michael Porter Jr. and coach Brandon Roy won the Naismith National High School Player and Coach of the Year, the Atlanta Tipoff Club announced Monday. Porter, who will be playing in the McDonald’s All-American game next week, averaged 36.2 points, 13.6 rebounds, 5.0 assists and 2.4 blocks for the Raiders and was named The Seattle Times state player of the year. Roy took over as coach of Nathan Hale in June and rode seven transfers to the state title, an undefeated record (29-0) and national No. 1 ranking. The Raiders are in the running to win the national title when the final basketball polls are released early next month. Porter moved to Seattle this season as his father, Michael Porter Sr., was hired by Washington coach Lorenzo Romar. Porter and his younger brother, Jontay, committed to Washington over the summer. It’s not clear, in the wake of Romar’s firing last week, where any of the Porters will land. Michael took “Washington commit” out of his Twitter bio Friday, and Jontay tweeted he was reopening his recruitment. Porter and Roy will be honored at Nathan Hale in April. The Naismith award is decided by “a select group of basketball journalists from around the country who form the Naismith Awards national high school voting academy,” according to the release. The award was first given in 1987. Porter is the first player who played for a high school in Washington to win the award. Porter was also named the Gatorade state player of the year Monday.